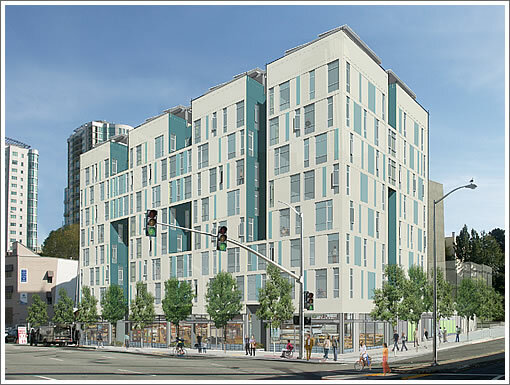 Construction, or parking lot deconstruction, might have commenced a few months ago, but in two weeks the ceremonial groundbreaking for the Rene Cazenave Apartments at 530 Folsom and the corner of Essex will take place. Once again, it’s an eight story building with 120 below market rate apartments for the formerly homeless, a suite for supportive services, and two market-rate retail spaces that’s rising on the former surface area parking site and the building is slated to be construction complete by the end of 2013. These housing projects have always proven to be a well-intentioned path to hell for both residents and neighbors. Gosh, what a waste. The area had so much potential. Whether you want to admit it or not, the high price units nearby will take a hit. The Bridge Housing web site says that this project will cost $36mm. I don’t know what the “below market rent” will beset at, but if it is around $500 the city will come up at least $1K/mo to $2K/mo short every month for every unit ($1.4mm/yr to $2.9mm/yr). It would be a lot cheaper to just send the “formerly homeless” a $500 check every month as long as they actually leave the state and stay out of San Francisco. A Catholic priest that has worked with the homeless for 40 years once told me that close to 99% of the (real living on the street for over a year) “homeless” have serious mental and/or drug/alcohol problems. Does anyone know what conditions have to be met in order to qualify for these units? Does someone have to have actually lived on the street? Is it lack of income or is there an income limit? Do people get drug tested regularly to qualify? Is there a mental evaluation? And what happens if one of these qualifiers is then no longer applicable? Are people evicted – and then back on the street? @FormerAptBroker, that priest was spot on. I live in the area and I wish people would stop calling people “homeless”, a more apt name is “street people”. They potentially can avail themselves of existing city resources (they are places to shelter for the night, or SROs), however because they are not allowed drink or drugs they stay on the street. Doesn’t say who the architect is? What firm? Anyone know? It depends on the motivation of the organization managing the building. Their mission is probably to lift people out of dependence and poverty. If they’re true to that mission then they’d want to migrate their successful clients back into the real world of holding a job and paying their way. However if their cash flow motivations steer them towards administrating as many “wash, rinse, and dry” procedures then they might be motivated to release clients back on the street before they can stand on their own in hopes of churning them back through the program next year. It is kind of like how the real estate industry isn’t too concerned about putting people into houses that they can’t afford. Bankruptcies churn more transactions, creating more commissions. And yes, there’s a certain subset of people living on the street who prefer it that way because they don’t tolerate the rules of charity housing. So homelessness cannot be completely eliminated unless we create homes that allow 24 hour intoxication and the liberty to do whatever you want. Until then that place will be the streets. As Milkshake says, the chief problem with FormerAptBroker’s implicit claim that if The City avoids building projects such as this one that “people we would be better of without” will somehow leave is that the people this project is designed to house are incredibly resistant to market signals. They won’t change their behavior, they’ll just stay on the street causing mayhem and eating up expensive services. Not that I’m defending it, because I think it’s morally bankrupt, but getting people off the street and into regular contact with supportive services saves taxpayer money because they use fewer emergency services. The most costly user of publicly financed emergency health services in San Francisco — a “frequent flyer” in emergency room parlance — is 49, Caucasian, schizophrenic, and addicted. He has been listed in at least two concurrent city systems as homeless (either continuously or episodically) for 16.6 years. He’s a frequent caller of ambulances (more than four times a month), a frequent user of detox and sobering center services, and a high utilizer of mental health services (including psych emergency). He is very, very ill. Based on three years of mortality data for very similar people, his chances of dying this year alone range from one in 10 to one in 20…last year he used an estimated $155,453 worth of emergency and urgent services alone (not counting other medical costs). In each of the three years that anyone’s been keeping track, he’s ranked in the city and county’s list of highest utilizers of multiple services. Emphasis added. Compared to that, “coming up at least $1K/mo to $2K/mo short every month for every unit” is a drop in the bucket. And someone who’s been living on the street as a hard-core addict for over sixteen years simply isn’t going to change their behavior in response to market signals. Again, I’m not defending this because I don’t agree with the policy on a moral level, but I understand the economics of it once you agree that you can’t just turn homeless addicts into Soylent Green. > incredibly resistant to market signals. ^^^ How do you convince Arizona to take the burden that SF carries? And what would prevent the $500/mo. recipient from migrating back to SF and have a friend in AZ forward his check back west? You don’t have to convince Arizona or any other state. Just give street people a free bus ticket to wherever they want to go. But really, a lot of the chronically homeless in my hood have serious mental issues. They need professional help but that’s not going to happen anytime soon. True, especially since AZ state would probably have no qualms with returning them to the sender. This building has great modern style and the light wells, or shadow wells as they seem to be pictured, will give superior access to air circulation compared to monolithic building types. It is like we are learning how to build functional buildings all over again using modern methods and materials. Interpreting homelessness as a moral issue is not an excuse to abandon reason. Various approaches have been tried for handling this population, so we have a fairly good idea of who is there and who works. Many homeless nowadays are ordinary folks who hit bottom and have a hard time getting back up. Social services often restore them to functioning normally within a few months. Bus tickets away are already aggressively offered, so the remaining population need something else. There is such a thing as “evidence based”. It works best in medicine and business, and in science and engineering it isn’t even optional. In technological terms, it makes more sense to upgrade to fuel injection than to question the morality of malefunctioning carborators causing stalls. Condemning homeless as defectives who simply don’t belong is like swearing at a rattle noise made by a new car. Life happens. Are you going to participate responsibly or not? I think a more appropriate spot is just a tad further south than Santa Barbara: the front lawn of the Reagan Presidential Library in Simi Valley. Somehow people who don’t like “wasteful government spending” have foisted this responsibility and cost onto urban taxpayers. Busloads of Dr. Gurley’s “frequent fliers” showing up in Simi Valley might underscore the political and policy origins of our current homeless issue. Why should City taxpayers solely bear the cost of this society-wide problem? Well intended terrible project that will fail. Give it 3 months before the place erodes to a worthless dump. Too bad as it will drag down the area. I’d be interested to see what businesses set up shop there ay “market” rates. Ok, so tell me, all you complainers , you people with grand ideas on how to “really” solve the homeless, the down and out, the drug addicted problem in our city. Just how the hell would you do it? It is a much larger problem than sending them to Arizona. Sure, let Sheriff Arpaio take over! Pretend we live in the old west. Seriously, this is a tough problem. How can we solve it. Allowing these human beings, at the very least, to live in decent housing is not immoral. First, you accept that there is a certain fraction of the population that is not capable of running their own lives, and worse, are actively a menace to other people’s lives. Second, you identify these people. Third, you institutionalize them for the rest of their lives. But, of course, you were asking how we “fix” the problem without employing any kind of force or coercion or negatively impacting the civil rights of these people. The answer to that is, we don’t. If my memory serves me correctly this project was originally planned to serve the chronically and persistently homeless folks who have been living on the streets the longest. Many of these folks also have coexisting and/or mental health issues. This housing was intended to be a “first stop” in independent housing with supportive services to assist with the transition from the streets to housing. Do we know if this is still the plan for these apartments. CeCe wrote: Doesn’t say who the architect is? What firm? Anyone know? Leddy Maytum Stacy Architects (“LMSA”) has 25 years experience, including the Plaza Apartments, which was the first new construction 100% supportive housing building for formerly homeless people in San Francisco and has won several architecture awards. LMSA’s work has been recognized by the U.S. Green Building Council and the International Conference on Sustainable Building. Hope that helps. I may not agree with all of the aesthetic choices made for this project, but I applaud the work they are doing overall. I like RR’s idea of highlighting the connection between Ronald Reagan and the results of one of the most failed pieces of social legislation at the state level in my lifetime: the infamous Lanterman-Petris-Short Act, which Reagan signed into law when he was Governor of this state and which was the proximate cause of all the chronic inebriates and untreated schizophrenics on the streets of The City. This same statute is what underlies and perpetuates the conundrum alluded to by diemos’ comment. Ha ha! You’re mad because a few frequent fliers cost us $100K per year? Try putting them in institutions. Then they can ALL cost us $100K per year! Homelessness and Rent Control comes hand in hand. Data have shown that cities with very strict rent control also have higher rate of homelessness. So the first thing I’d do to reduce (notice I said reduce, not eliminate) homelessness is to get rid of rent control. It doesn’t matter how many charity condos you build, as long as there is rent control SF will have a homelessness problem. ^^^ Best analogy of the month, FAB! Giving BMWs to poor families actually will make more of their kids go to college if you think about it. They will have reliable transportation to and from schools (a big problem for poor families), they can use the money that would have gone to car payments toward books and learning supplies, the kids can go to school instead of taking on jobs to help with the car payments, and it helps ease their piece of mind regarding transportation and make focusing on schools easier, and it improves their self images and make them more confident about making it to college. I’d suggest that instead of BMWs, give them Prius instead because they save on gas money. Also, have a condition where if the kids do not make colleges then the Prius can be taken away and a monetary penalty is imposed. Rent control provides an advantage to renters who happen to have lived in the same unit for a long period of time. It actually is a disadvantage to a new renter, whether he or she is new to the area of simply is moving from a different unit in town. The landlord will find a way to make a profit. Rent control doesn’t change this. It only changes who gets stuck paying higher rates to subsidize the lower rate units. It is a form of discrimination. It provides an advantage to people who stay put in the same unit at the expense of those who don’t. One can make an argument it is fair or unfair. For homeless, who do not have a rental unit, it wouldn’t appear to help as it results in higher rates for new renters. You would be hard pressed to find any Bridge projects that qualify as failures. I cannot think of even one, can anyone else? The landlord will find a way to make a profit. Rent control doesn’t change this. How? If a landlord is stuck with a building packed solid with rent-controlled tenants who pay less then 1/2 market rate, how do you suggest he makes a profit? You cannot adjust rent, period. Short of 1) passing the hot potato to someone else (at a huge discount), 2) causing a lot of grief through Ellis evictions (poisoning the rental/resale well for years) or 3) buying out the tenants either officially or under the (tenant’s union) radar and at great expense, he has no way out. If all 3 cases the landlord is just throwing the towel which is why it’s so darn hard to find a rental in this City. Better converting rentals into TICs if you ask me. Sure he can wait for tenants to leave on their own. Yeah, right. Got 40 years to spare? Have you followed the Jasper Place debacle of a few years back? All these bellyaching landlords railing on and on about how rent control is the worst affront to the tin god of the free market make me laugh out loud. I agree with sfresident; the landlord will find a way to make a profit regardless. First, rent control doesn’t even apply to buildings built after 1979. Second, if rent control is such an imposition on the ability of financially savvy small businesspeople to make a profit, why are people fighting over property in order to become landlords in The City? The question practically answers itself. Anyway, all of that has little or nothing to do with this project (the Rene Cazaenave Apts. ), because the people who are going to be housed in this building once it’s completed are highly unlikely to be the kind that are going to lease the $3000 a month two bedrooms that the bellyachers are offering. That’s one of the reasons they’ve been living on the street. – Laughable. There’s a myriad of reasons these new residents have been living on the street; most notable would mental health issues and addiction. I’d be hard-pressed to blame the fact that a 2BDR unit in SOMA rents for $3000 per month as one of the reasons they’ve been homeless. Poorly worded on my part. I agree that most of them have mental health and addiction issues and I wasn’t blaming the price level of SOMA apartments for their homelessness. I was, however, saying that if rent control were to disappear tomorrow as the bellyaching landlords wish, homelessness wouldn’t be resolved overnight or even markedly reduced. Brahma – got it. Thanks for the clarification. I’ve got to imagination the residents of Guy Place whose units face North can’t be thrilled about this. I’m guessing they’ll be looking right into the units of this building from their living room. That’s part of the SF premium. Brahma, private landlords need an incentive to build rental units and rent them out. Who cares as long as you have cheap rent, right? Expect more landlords doing furnished corporate rentals (like I do) and skipping the normal rental trap. I collect more rent and do not have to deal with risks of entitlements. Problem solved. lol, I agree that “private landlords need an incentive to build rental units and rent them out.” And you know what? The market rates that you so covet are readily available to such landlords “building rental units” and subsequently “renting them out” because…the rent control regulations you so decry don’t apply to newly-built buildings. That’s because rent control does not apply to buildings built after 1979, as I said previously. When those new units at One Rincon Hill Tower Two are built, I seriously doubt that the rent will be cheap. Point taken on new property. Though with enough pressure the rules could change for them too. On rent controlled property, I always quote the Jasper Place as an example of a big mess created on on the back of a landlord. Tenants haven’t adjusted their lives to their age or income because of the cushy situation, and the landlord gave up and sold to a risk-taker who tried to regain control over HIS property. As soon as the new buyer tried to start an Ellis eviction, a Supe suggested changing the permit rules to punish this specific owner. It ended in a debacle. Poor tenants got to stay. Middle class entry level buyers will have to wait. That’s not a good climate and only the rich and the “entitled/vulnerable” will benefit. The rich will always buy their way in, and they have absolutely no problem seeing the middle class vanish. They keep their hands squeaky clean while “advocates” kick the middle class to the suburbs with construction like 530 Folsom. How does 530 Folsom kick the middle class to the suburbs? I agree in principle that we need more mental health services and that people who are mentally ill and are refusing their medication (and maybe taking recreational drugs) often engage in anti-social behaviors that are a nuisance to other people. But I am not sure if locking them up for the rest of their lives is the answer. Lots of people are able to function just fine when they are sober and taking their meds. This place will end up doing a lot of good for a lot of people. I wouldn’t want to live across the street from it either though, I acknowledge that. Maybe we need a drying out facility far away from urban temptations. Doesn’t San Francisco own some rural land somewhere that we can use to send the chronically homeless and help them break the cycle of dependency? It’s one brick part of a larger edifice. There’s a lot pressure to kick out the middle class from the top. See the latest Beacon property sale thread for the typical “I can’t believe it sold for 800K+” comments. This is a typical young couple apartment but yet out of reach to most young couples in SF or the BA. There are 2 essential ways to make SF more middle class friendly in the current situation: 1) – making the market more fluid / increase turn-over by repealing entitlements such as prop 13 and rent control, and 2) – increasing supply precisely for this middle class. Projects like 530 Folsom are at the same time symptoms and causes preventing these 2 things. 1 – You have to build housing to the homeless because no-one want to rent to the lower end, even people with reliable SS checks. A more fluid market would find a niche. Say a 2-bedroom apartment that can be shared by 4-5 people. Not ideal, but this is the way many students live after all. Instead these places are hogged by rent-controlled tenants and landlords cannot make them more efficient. And now you have to build housing for some of these people who could have found their place in a normally working market. 2 – These lots are a very valuable public asset. Because the needy always have a higher priority, we’re using these lots for that purpose, preventing much needed square footage for the middle class. I gave earlier the sample of a city that is further in its path to become a 2-tiered society: Santa Barbara. 100s of formerly homeless live one block from the beach, get many services by not-for-profits as well as government entities. They are funded by taxpayers and wealthy angels alike. Guilt money flowing. Middle class fleeing. Well there’s always the Farallons though I wouldn’t wish living there on anyone. Then there’s that little sliver of SF that lies on the western edge of Alameda Island. But the most logical place would be Treasure Island. Already used as a site for training at-risk teens. There are 2 essential ways to make SF more middle class friendly in the current situation: 1)…and 2) — increasing supply precisely for this middle class. Largely in response to the city’s growing technology sector, 22,000 residential units are in various stages of approval and construction. In a few years, residents could be signing leases for new addresses in South Beach, South of Market, Central Market and Mission Bay. “There’s been so much approved over the last four years that’s never been built, so there’s essentially a backlog of projects waiting for financing,” said John Rahaim, the city’s planning director. Since 2008, only about 1,710 units were built each year, compared with an average of 2,220 each year between 2004 and 2008, according to the department. Now, five major dwellings that were approved before 2008 and stalled during the recession have been restarted. Developers have begun, completed or been cleared for construction on more than 2,000 units. More are on the way. Eight residential buildings, with more than 1,300 combined units, received building permits last year. There are permit applications for another $1.6 billion worth of projects, Department of Building Inspection records show. Emphasis mine. In a few years, there’s going to be substantially more rental units available on the market. Its not at all clear, however, that these units are going to be aimed at “the middle class” or be affordable. They certainly won’t be affordable to the folks who are going to be housed for the first time after a long stretch of homelessness in the units that make up this project. From a public policy perspective, it’s NOT that “the needy always have a higher priority”, its that the needy are underserved, if at all, by the marketplace. And I’m sorry, I simply can’t understand how “making the market more fluid / increase turn-over by repealing entitlements such as…rent control” is going to appreciably “help the middle class”. I know you and every other landlord just have a bug up you bum about rent control, so I’ll just ignore that and respond to “increasing turnover”. Look, moving between apartments is a pain in the keister, and you can easily spend $1,000 to $1,500 just in moving-related expenses. Those expenses represent negative utility, or at best, friction costs. Most rational actors would want to minimize these costs. The reasonable reasons a middle class person should want to do it (move from one rental unit to another) is because he or she got a substantial raise at work and is currently in an undersized place, or because their life situation changed substantially (moving in with a new partner after living alone or with roomates, getting married, having a child, etc.) calling for a change in accommodations. I’ll fold getting a completely new job, in a new city or part of town and minimizing the commute into those. In these situations, the marginal benefit of the new place outweighs the marginal costs. Is there something I’m missing? From the renter’s perspective, that is? Forcing people to move frequently just for the sake of a “fluid market” is just something I don’t understand unless it’s from the point of view of landlords who want to raise rents either a large dollar amount or frequently or both, and can do so most easily when a tenants’ lease is up and the tenant moves. I certainly don’t understand how it “helps the middle class”, unless there’s a large middle class subset of masochists who enjoy packing and unpacking and replacing broken glassware. Stick with increasing supply, at least that argument has the advantage of not immediately revealing that you’re talking your book. I stopped reading after that. If you can get your point across without these artifices, then do it. Otherwise it’s simply not worth reading. @milkshake of despair talks about ‘training teens on Treasure Island”. Training them to do what? Here’s the web site for Job Corps. It is more than just teens, they accept young adults as well. http://treasureisland.jobcorps.gov/home.aspx. It looks like much of the training is centered around construction though there are other vocations as well. Seems like a great way to re-purpose the old Navy infrastructure. Job Corps is committed to offering all students a safe and secure environment. That’s why we have a Zero Tolerance Policy for violence, alcohol, and drugs. Any student who breaks this policy will be dismissed immediately from Job Corps. Emphasis added. I agree that this program is a useful re-purposing of old Navy property, but even assuming it is effective for its target population, such a program isn’t likely to be useful for the folks who will ultimately be housed in the Rene Cazenave Apartments. To be sure, there are long-term homeless people who have the ability to hold down a job after training and who don’t have issues with drug and alcohol abuse, but I think the reason that this project is being built in conjunction with supportive services is because the overwhelming majority of residents housed here will need to take advantage of those services, get clean and sober and stay that way, before a residential job training program would be helpful to them. Leaving aside the homeless untreated schizophrenics that wonder down market street screaming to themselves (NoeValleyJim: passing Proposition 63 was supposed to help with this, but of course the person has to want help and they oftentimes don’t realize they need it, which is another point that diemos was implicitly making), lots of people simply need to be disabused of the notion that drifting in and out of drug-induced hazes every day and making the focus of your existence scoring another hit is a reasonable way to go through life, despite what recreational drug use advocates would like to believe. …the chief problem with FormerAptBroker’s implicit claim that if The City avoids building projects such as this one that “people we would be better of without” will somehow leave is that the people this project is designed to house are incredibly resistant to market signals. They won’t change their behavior, they’ll just stay on the street causing mayhem and eating up expensive services. Having tried everything else, the managers of San Francisco’s Bill Graham Civic Auditorium are blasting the overnight homeless off their doorstep with the high-decibel sounds of chainsaws, motorcycles and jackhammers – topped off with an aircraft carrier alarm. Not everyone, of course, appreciates the after-hour concerts. “What s—behavior,” said Oscar McKinney, a homeless man chased away from the building one recent night by the sounds of sirens and revving motorcycles – a far cry from the likes of Phish and Paul McCartney, the usual Another Planet fare. McKinney, by the way, says he has racked up 6,100 quality-of-life citations. Emphasis added. Obviously, someone living outside the Civic Auditorium racking up over six thousand citations isn’t going to be deterred into not being homeless by market signals or infraction-level law enforcement. He also isn’t going to just disappear because services aren’t being offered in order to avoid being a “magnet for homeless people”.